UPDATE: The Blaze is now reporting that Mark Hughes was misidentified by police and is no longer a suspect, but was a law abiding, open carry citizen. 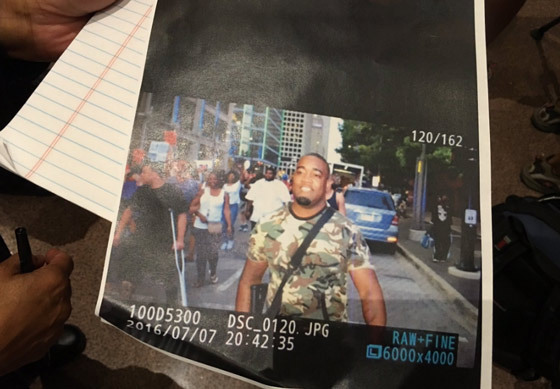 After police misidentified a black man legally carrying a rifle as a suspect in the Thursday night Dallas shooting, the individual is asking for an apology from police. Hughes told reporters that when he realized he was wanted as a suspect he “flagged down” a police officer and turned himself in and surrendered his firearm. He was later released. “We asked them, we said, you know what, now that you all have my face on national news, are y’all gonna come out and say that this young man had nothing to do with it?” he said. Hughes said that he and his brother, Cory Hughes who came to his defense on television, have received “thousands” of death threats. “I feel that they need to do something about that,” Hughes said.